And what could be more decadent than a dessert that requires its very own bit of kitchen equipment? Ok, so I know you can make crème brûlée by putting your ramekins under a very hot grill, but my oven’s fairly ancient and I’ve read enough horror stories about melting puddles of overcooked custard to realise that it’s probably not quite up to scratch for this task. I also love buying new kitchen equipment, and it may sound stupidly childish but there’s something really rather exciting about owning my own blowtorch. I feel like a proper cook. The way it turns a pile of unrewarding white grains into a mass of golden brown bubbles is almost magical, and the moment I cracked through glassy sugar shards to the smooth custard below, I couldn’t have been happier with my investment. The recipe I’ve decided to post isn’t just any old crème brûlée. 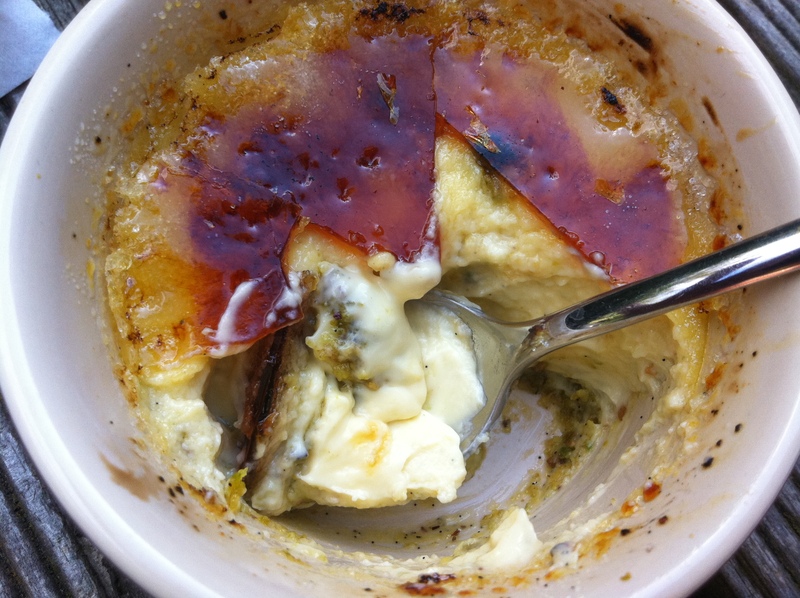 This, dear reader (cue seductive M&S voice) is an Eat Like a Girl crème brûlée, taken from this fabulous food blogger’s new book, Comfort & Spice. If you haven’t heard of Eat Like a Girl – aka Niamh Shields – check out her blog now. One of the UK’s most famous food bloggers, she’s known for her generous, honest, original recipes and reviews, and has just published this warm and wonderful book for fans around the world to add to their kitchen bookshelves. Whenever a new recipe book arrives, I naturally gravitate towards the desserts at the back, and this one immediately caught my eye. ‘It’s very like making the custard for an ice cream, so once you’ve conquered one, be sure to try the other’ says Niamh into the introduction to Pistachio Crème Brûlée. Anyone who reads this blog on a regular basis will know that I’ve been obsessively mastering the art of making custard since receiving an ice cream maker for my birthday back in July, so this seemed like the perfect place to dive into Niamh’s cooking. The resulting dessert is wonderfully decadent, and a complete surprise (in a good way). The simple custard is rippled with a swirl of slightly salty nut butter, adding a delicious extra dimension of texture and flavour. The slight crunch of the pistachios offsets the thick, cool custard, and their salty tang prevents the cream from being too cloying. I’d definitely recommend using a blowtorch to create the glassy sugar crust – the way it cracks when you plunge your spoon through to the creamy custard below is just so satisfying. And definitely use a real vanilla pod. Niamh’s recipe suggests a teaspoon of vanilla extract instead, but I suspect this substitution might just be to keep readers happy by staying in keeping with the book’s more frugal ethic. Nothing beats the flavour of real vanilla, and I love the visible little specs of black you get running through the cream. You can see some of these lovely seeds in the picture below, along with a little layer of pistachio. It might look a bit like pesto, but I promise it tastes incredible . . . 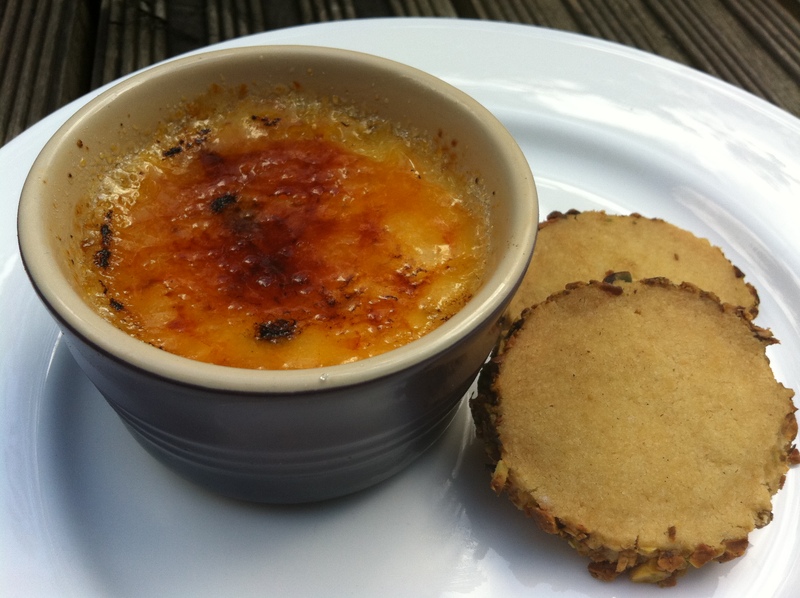 I served my crème brûlée with shortbread biscuits taken from the Ottolenghi cookbook. A feather light, super short dough of butter, sugar and rice flour is infused with cardamom then rolled in chopped pistachios. I’ve not included the recipe below, but they work really well with the creamy custard so do check them out if you plan to make this pud. The recipe below serves six people, but you can easily scale it up or down depending on how many people you’re cooking for. Preheat the oven to 150 degrees C. Put six ramekins in a deep roasting dish and pop the kettle on. Heat the cream and sugar over a medium heat until just before boiling, then drop in the vanilla pod and seeds. Remove from the heat and leave to infuse and cool for 10 minutes. In the meantime, blend the pistachios, salt and oil until you have a smooth, firm butter. It’s nice to leave a few coarser nuts for texture. In a bowl, beat the eggs yolks until frothy. Remove the vanilla pod from the pan of cream, then whisk the cream into the egg yolks slowly, ensuring you don’t cook them. Strain the mixture into a large, clean bowl. Distribute the mixture between your six ramekins. Stir a tablespoon of nut butter into each ramekin and swirl to make a ripple effect. Pour hot water from the kettle into the tin so it comes half way up the side of each ramekin, then pop the tin in the oven and bake until the custard is set, with a slight wobble – between 30 and 40 minutes. Allow to cool in the fridge for at least a couple of hours, ideally overnight. When ready to serve, sprinkle about 2 teaspoons of sugar over the top of each brûlée, making sure it reaches right up to the edges. Use a cook’s blowtorch to caramelize the sugar, allowing the heat to create a bubbling golden layer. Return to the fridge to set for a few minutes, then serve with crumbly pistachio shortbread, a spoon and a big smile. Enjoy. I don’t normally like creme brulee but I might try this one because of the pistachio twist. Thank you for sharing! looks great! and littleloaf, i love excuses to buy new kitchen appliances as well! Fleur du Poirier – thank you 🙂 A proper kitchen mixer and pasta maker are next on my list, but not sure my little kitchen can cope! It looks absolutely delicious; that sugar topping on your crème brûlée is just magical! I always look at the desserts in a cookbook first too (and I LOVE dessert cookbooks :D)!! I’ve yet to purchase a blowtorch for my kitchen, but it does sound incredibly fun!! 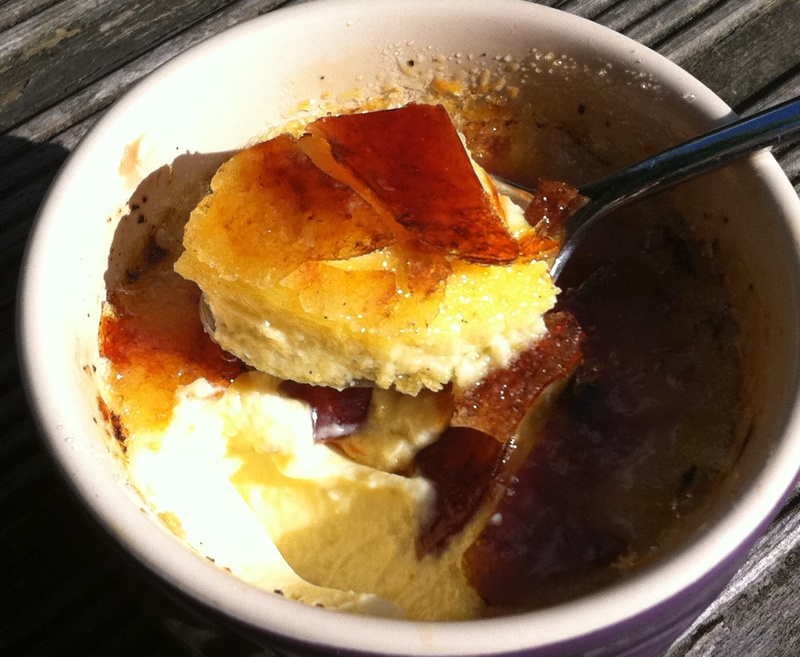 Your creme brulee looks very decadent- the custard looks so smooth! Looks absolutely delicious, I’m can always be seduced by anything containing pistachios…. Crème brûlée is my favourite pudding bar none. The recipe sounds fab. As soon as pay day comes round, my order for Comfort & Spice is going through! I LOVE crème brûlée. I’m not a huge pudding person, but this is the one dessert I do order in restaurants time and time again and this just looks and sounds exquisite. I also really really want a blowtorch, but I think I’d be flaming everything in the kitchen if I did! 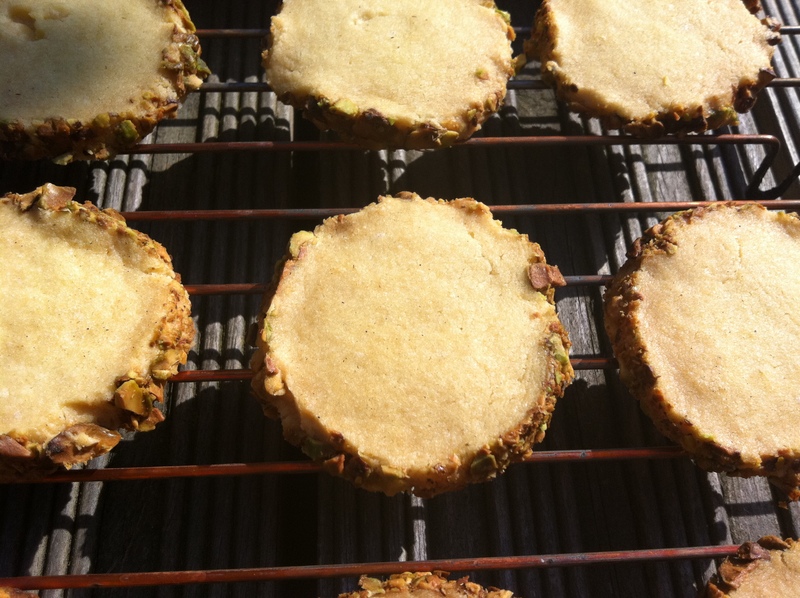 Faerietale Foodie – having made these I’ve got the pistachio baking bug…they look so pretty AND taste incredible. Gin & Crumpets – it’s a great little book. Wish there were more photos (there are none of the crème brûlée) for example, but otherwise 100% recommend. Miss South – not a huge pudding person?! If you can convert me to lamb and rollmops, hopefully some of my sugar obsessed posts will get you more into dessert 🙂 And yes, I do want to flame pretty much everything in sight (which is why I’ve never bought a deep fat fryer, I fear I’d want to experiment deep-frying everything!). oh my gosh, even just the title of this has me drooling! what a wonderful dessert! I love the pairing here! I love Creme Brulee, but sometimes find that restaurants miss the mark with the flavour. This recipe sounds wonderful, I would never have though of pairing it with pistachio. That’s so funny– I found your blog about two days ago from london bakes and I wrote down your blog under my “sites to check out” list. 😀 Looking forward to readings yours as well! Haha I love the part where you consider finishing the creme brulee in the oven and realize yours is old and it will melt in a puddle because I have had the same thought process! My oven is old and crappy and I swear I couldn’t burn something in there if I tried. Anyway I love everything about this recipe and have long considered buying a little torch – this may have put me over the edge. What Katie’s Baking – haha, glad you like it! Anh – it’s a really good combination. I’m thinking of trying coffee next – there’s this wonderful restaurant in Italy we go to every year that serves miniature doughnuts, chocolate krispie cakes with popping candy and a tiny coffee crème brûlée which I really want to replicate. With Milk & Flour – totally agree, lots of restaurants make them too big, or too gloopy. Much better to make at home to your own taste! 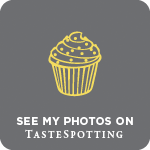 The Moveable Feasts – I love discovering new blogs, looking forward to catching up soon! This is an absolutely stunning looking dessert. The crackly top, the custard beneath and the heavenly pistachio on the bottom plus the shortbread…oh my goodness! It was totally worth buying the blowtorch. Except now you have NO excuse in the world not to buy cups and tbsp!! Manu – so pleased you like it – do let me know how you get on! 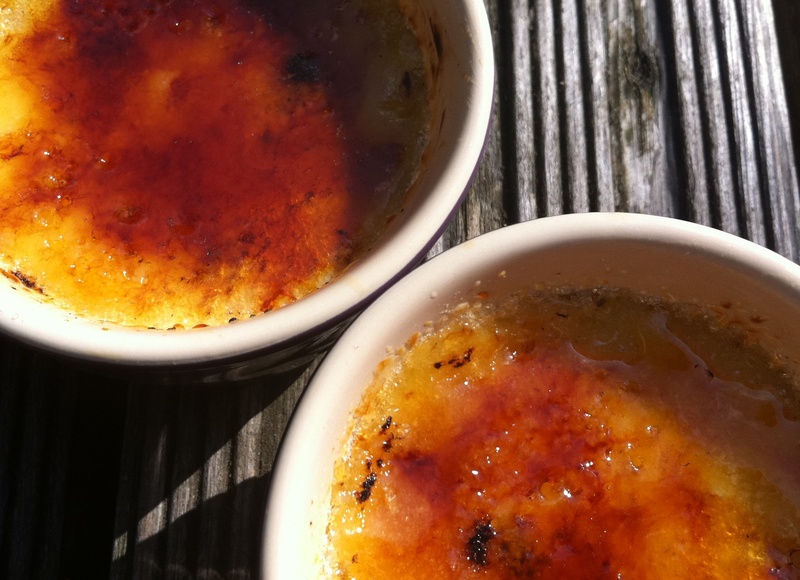 My husband is OBSESSED with creme brulee so I love to make it and actually have a list on my blog of the top 10 restaurants to eat it at in London as he orders it every time we go out for dinner. Love the addition of pistachios here. Just had a read of your top 10 post – it’s brilliant 🙂 If you make the pistachio version I’d love to hear his verdict! Looks wonderful! I love breaking through that crackling sugar crust on the top of a creme brulee! Ooh, that sounds yummy too – will definitely give it a go as have some cardamom kicking around from a cake I made recently. I love creme brulee and the crackly top here looks so perfect! I have this book and definitely will give this recipe a try now.